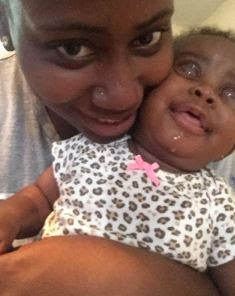 A mother, Kiara has shared a touching story of her beautiful daughter, Kenesley Ayanna who was born with a rare genetic disorder, Anophthalmia (born without eyes). She was hit with the news a day after she gave birth to her bundle of joy.Just after giving birth, she noticed her baby had a lump in her left eye and demanded that a test is done. "When we found out I was having a baby girl, I was so excited and started planning her whole life out in my head. Dance schools, gymnastics, modelling etc. All cute things that little girls do. And to top it off, my best friend proposed to me, taking the next step to making our family one! Life was looking up and I couldn't have asked for anything more. I ate all kinds of healthy foods, drank the best water, Google was life and avocado became my best friend lol. The day came on 3.15.2017 at 5:34am after having labour pains for almost two days. It was a natural and easy birth and God blessed me with a beautiful baby girl - Kensley Ayanna. But I noticed something.. it was a big lump under her left eye and her eyes were swollen. I asked the nurses and doctors I saw that day and everyone told me it would go down, not to worry about it. But I pressed on because I wanted her to open her eyes.. to see me and her dad. The next day we were hit with heart breaking news. "We didn't find any", is what they said to us. My heart fell to my stomach. My fiancé broken like never before. In an instant it pulled us closer together.